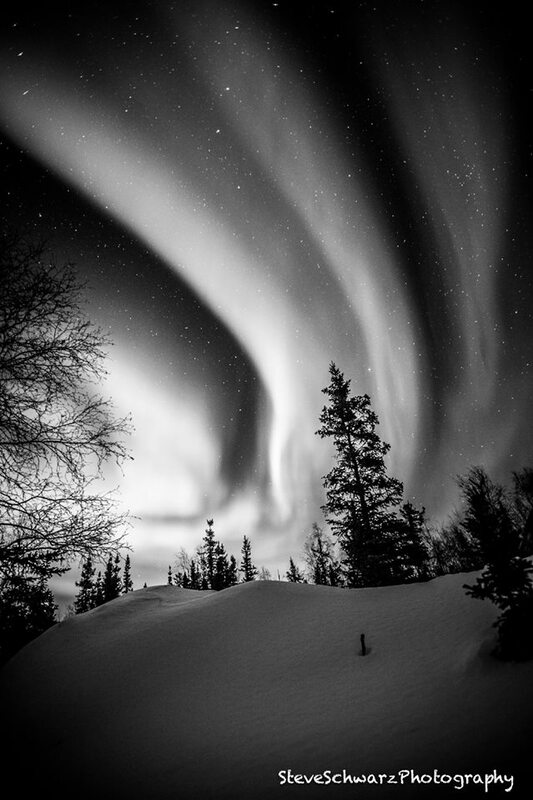 ‘Aurora in B&W’. Ok- I know what you are thinking…’Surely there is a law against posting Aurora photos in black and white’, and do spare me the threats of a lawsuit.Use your imagination. A crisp clear winter evening, the aurora are dancing all across the sky. As you stare at the aurora, they speed up and slow down, they fade and grow into bright vibrant colors of green, magenta and thin streaks of white on the lower edges of the aurora. You see shapes of fire, faces and figures that at times seem to be waving. Your world is above you. There are no thoughts of yesterday or plans for tomorrow, your mind is in the present.Even a photo in color cannot give you a feeling of being there. You need to experience the aurora with your own eyes, and see the colors in your own mind.